"My engines' roar is my enemies' song of doom!" Profile: Rattling the very air with the roar of his jet engines, Thrust is one Decepticon who cares little for the ways of deceit. He believes that half the battle is won if he can "psych out" his enemy by his mere arrival, and so he makes no attempt to be sneaky. His ability to suddenly and powerfully accelerate can literally shake apart a nearby building, and he delights in the havoc that ensues. He is a loud-mouthed braggart who is prone to pompously claim certain victory before a fight has barely begun. But in truth, his courage is as much bluster and noise as his actions and words: a strong counterattack by an opponent usually results in a view of Thrust's tailwings as he recedes into the distance. 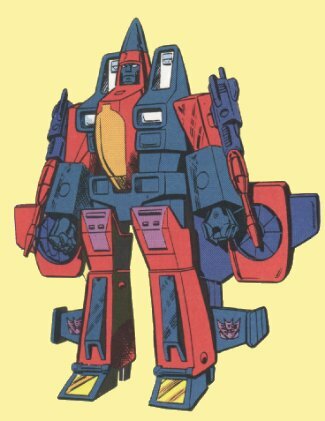 Abilities: In jet mode, Thrust can fly at speeds of Mach 2.5, but can accelerate in 20 seconds to twice that speed, which he can maintain for up to two minutes. He carries two concussion bomb missile launchers and two compressed air rifles, each of which can shoot a hole in ¼ inch-thick steel plate from a distance of 1200 yards. Weaknesses: Thrust isn't very brave. If he's not careful when rapidly accelerating, his engines can stall, causing him to fall.